Multilingualism has been linked to a variety of positive cognitive benefits, including early reading, better listening perception, improved problem-solving skills, and higher scores on school tests. Also, starting to learn a new language early will make it much easier to later learn a third or even fourth language, since the child is able to understand how the functions and structures of a language are organized in general. We live in a global, rapidly changing world, and in a multicultural society. Understanding other cultures enhances tolerance among people. The longer a person is in contact with a new language, the higher levels of proficiency in that language they can develop, so it is highly recommended for children to start learning a new language at an early age, so parents who want to give their child a head-start by teaching a second language, should start as early as they can. A baby’s brain can distinguish many more different spoken sounds than are present in their native language. As our language skills develop, we start recognizing only the sounds that are typical for our language. Young children are therefore still capable of learning new languages easily and without an accent, and that leads to better listening skills and a sharper memory and retention. 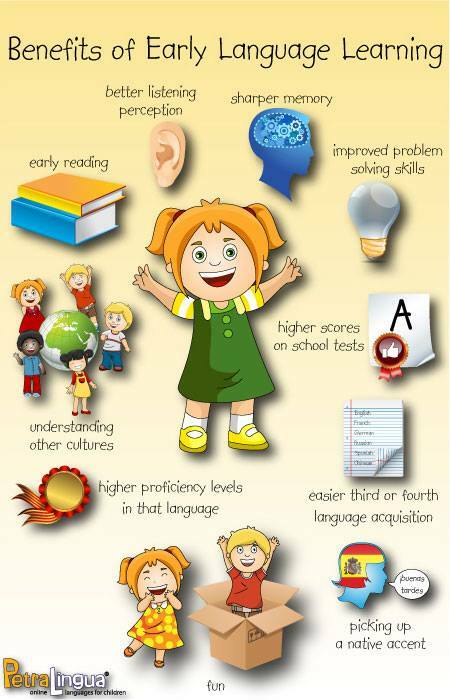 However, the key advantage to learning languages early results from children’s natural sense of curiosity. It motivates them to learn a new language without any effort, by exploring, just like they do in their first language. Learning languages should be fun. When presented in an interesting and attractive way, it is an enjoyable learning activity. And because a child’s first learning successes are often achieved with little or no noticeable effort, this builds the child’s self-confidence and their desire to learn continues.